Road Trip Memories » See the USA! Of course, I haven’t been everywhere, and it would be impossible to literally go everywhere in your lifetime. But let’s narrow “everywhere” down to those places listed in the Johnny Cash song, “I’ve Been Everywhere.” I love that song, and it’s fun to play on road trips! “I’ve Been Everywhere” was originally written by Geoff Mack about Australian towns, and was later adapted by him for release in North America, by changing the locations to those in the United States and Canada, with some exceptions in Central and South America (Tocopilla, Chile; Costa Rica; Argentina; Barranquilla and Padilla, Colombia; Salvador and Diamantina, Brazil). As I listened to the song this morning on my way to work, I wondered to how many places in the song I have been? Then I thought it would be cool to try to visit every place referenced in the song. So, as a travel goal, we are going to work toward visiting (or at least passing through) each United States town or state in this song. While its very unlikely that I will ever go to Central or South America, Canada is always a possibility. The lyrics to the North American version of the song are below, with the states included in parentheses and italicized (not in the song lyrics). Multiple states are listed when more than one state has a city/town with the same name. If I have been to a place listed in the song, it is bold. I used the criteria that I have been in anyplace bearing a name in the song, regardless of the state. If I have been in multiple cities with the same name, the city name and each state are bold. So check back for our progress!! The above map is interactive, you can click and zoom around it, and expand the left side with the icon on the upper right to see all of the places we’ve been in the song! Indiana is full of many hidden treasure from the shores of Lake Michigan to the banks of the Ohio River. One of them is a little known train trestle in southern Indiana, southwest of Bloomington in Greene County. 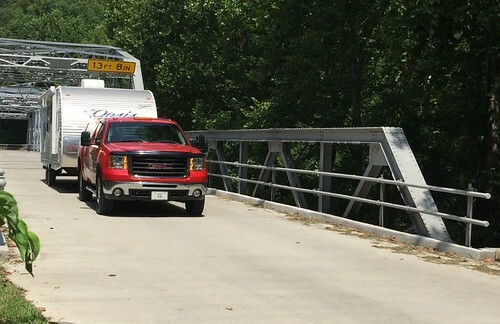 But “little” is the last word that should describe the Greene County Viaduct, affectionately known as “Tulip Trestle”. I first heard about Tulip Trestle some 15 years ago when a car club I was in made a trip to view the 2295 foot long structure. Tulip Trestle was completed in 1906 at a cost of $246,000, or over $6 million in today’s dollars. It was built by the New York Bridge Company using mainly Italian immigrants making some 30 cents an hour, which was an above average wage for the times. And considering it took just 18 months to build, it makes their efforts even more impressive. All told the 2295 foot trestle stands 157 feet tall at its highest point and is supported by 18 towers. Tulip Trestle is still used some 110 years after the first locomotive crossed it high above Richland Creek. Initially used to haul coal from Greene County mines, the Indiana Rail Road Company still makes several runs across it on a daily basis, and even shows off one of their trains crossing it on their website. I’ve visited Tulip Trestle several times over the past 15 years to soak in an incredible product of the early 20th Century engineering. However, I’ve yet to be there at a time when a freight train has crossed. But recently some locals have created an observation deck on the north side where visitors can view a passing train, or just stand there to view the expansive viaduct. 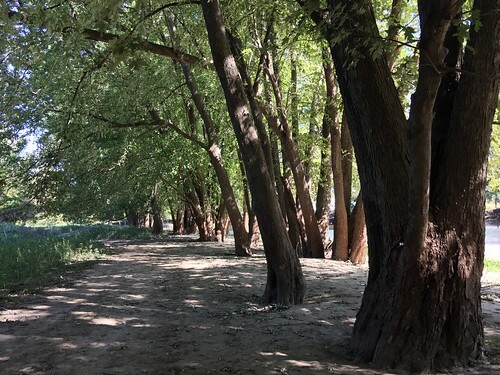 A Facebook page has been started by the group aiming to beautify the area around Tulip Trestle. You can join that page by clicking here. The Green County Viaduct, Tulip Trestle, Tulip Viaduct, or whatever you’d like to call it, is about a 40 minute drive southwest from Bloomington, Indiana. You can view a map on how to get there by clicking on the Google Maps link here. And when you make the trip there and aren’t fortunate enough to see a train cross with a typical load of coal, here’s a fantastic drone video, complete with an Indiana Rail Road train crossing. Enjoy! Our latest journey is another trip on Route 66. 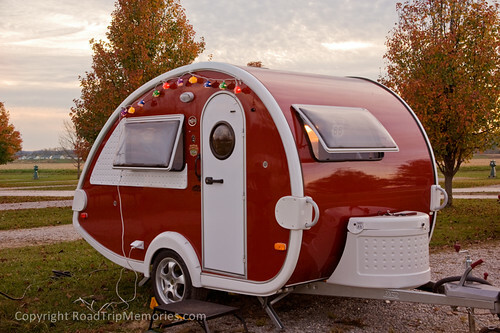 We decided to take our new Shasta Oasis travel trailer on this trip, rather than our typical road trip by car. We initially planned to start on Friday evening after work, but due to a late schedule, needed to wait until morning. We left early to ensure we could meet the schedule we had planned. That was another different aspect of this trip, that we would have some anticipated stopping points; travel less time per day, and spend a little more time in the overnight location. 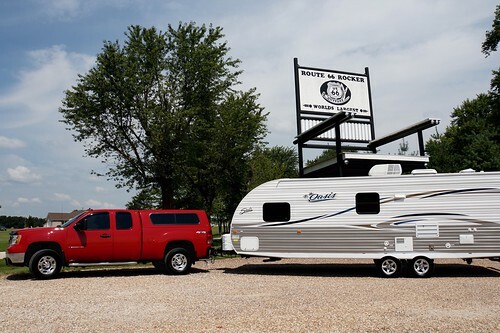 For the first day, our destination was Springfield, Missouri to the KOA where we stayed for the Birthplace of Route 66 Festival a couple of weeks ago. After we passed St. Louis, we took 66 mainly through Missouri, except in a spot or two. We stopped by Paris Springs to see Gary Turner’s replica filling station, Gay Parita. Sad to hear that vandals have been stealing signs and memorabilia after his death. His sons have taken down many of the signs to prevent further thefts. Gary’s daughter will be purchasing the property and opening it once again – hopefully, that will deter the vandals when someone is on site! We went next door to visit Teresa and John – fellow Corvair enthusiasts we met during the Springfield 66 festival last month after conversing on several 66 Facebook groups. Nice visit with new friends! Once we arrived at the KOA and he’d had some playtime at the KOA’s playground, we took our grandson to the Steak n’ Shake on Route 66 and then to Andy’s Frozen Custard. We enjoyed this KOA just as we had previously. There is a nearby train tracks and it is pretty close to a crossing, so when the train goes by, you do get the loud whistle sound. Whether that disturbs one is strictly personal preference. I can sleep with it, and fall right back if I wake up…plus I enjoy the sound. Your results may vary, but it’s good to know! We moved on the next day to the Tulsa area. We continued taking 66 as much as we could, stopping at as many places as practical given our combined total of 48 feet. Of course, we stopped at Afton Station to visit our friends Laurel and Ron. Jameson enjoyed the station and exploring the Packards and the old motorhome. Next, we stopped at the Blue Whale in Catoosa, which went well. Luckily, a year later, our grandson has a better understanding that leaving one place doesn’t mean the fun is over and he knows that there is more fun down the road! Unfortunately, on this day there would be a little less fun than we had planned. First, we ran out of gas in Tulsa. So much for the “Distance to Empty” feature on the truck, which still read 50 miles! Our Shasta came with a year of Coach Net from Forest River, the parent company of Shasta. They did very well, giving us an estimate of an hour but the service provider delivered the gas and we were on our way within 45 minutes. Two thumbs up! 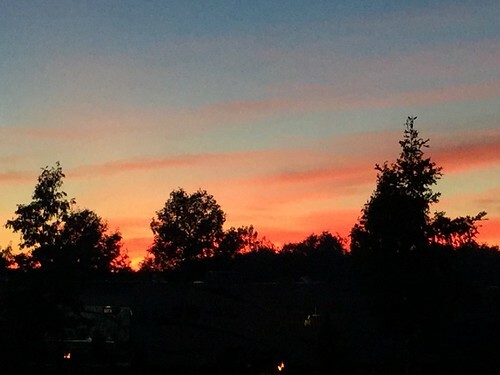 That was great service though the experience was still annoying and we were a bit cranky…and then to make matters worse, we found that our RV park for the night (Cross Trails RV Park) was not at all what we expected. Let me first say the good. The manager was very responsive and friendly by telephone (I did not see him in person, though). It was unusual, though, for him to tell us to meet his son by the dumpster along the fence after dark. Not exactly a usual or comfortable “check-in” experience. The park is very new and to some extent, that is a plus. The concrete pads are very new and in excellent condition, same for the electrical pedestal. And for what it’s worth, it was on Route 66. Beyond that, I have very little other positive things to say about this RV park. None of the other amenities appeared to be built or ready…no playground or dog park. The only building that was listed as the office and laundry was closed and peeking in the windows, it was still very much under construction. The grounds were similar, with piles of dirt and rocks everywhere. Many of the other trailers were in various ages and physical condition, with some having flat tires (along with their vehicles). All around, it was not a comfortable place to stay and I wanted to leave as soon as we could in the morning. I do hope that someday this park builds or makes available all of the amenities it has advertised….but as of September 2015, it does not. We did manage to sneak in a very short visit to the very cool playground in Sapulpa where we took our grandson last year. It got dark pretty quickly but he enjoyed it anyway! Our next day was to be a bit longer day, trying to get to Amarillo, Texas. Unfortunately, in western Oklahoma, the wind picked up considerably and we were getting a lot more sway with the trailer than we felt comfortable. We heard it was worse in Texas, so we decided to stop and stay at the KOA between Clinton and Elk City, Oklahoma. Not too much to do in the area but they had a playground and what more does a 4 year old boy need. This park isn’t bad (the grounds), though there are better KOAs. It doesn’t have much around it to do, except if one drives 12 miles in either direction to Clinton or Elk City (I did cruise Route 66 to Elk City to get some groceries and it was very peaceful!). 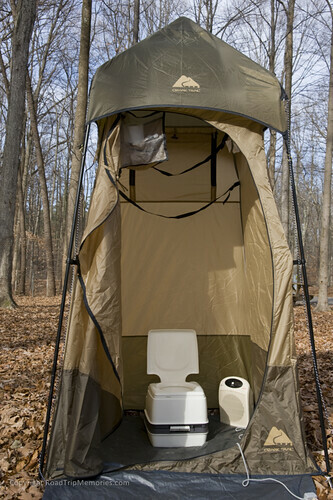 It’s very good for an overnight stop, but maybe at other times there are amenities and activities? Many KOAs have kids activities, but my feeling is this one is geared more to overnight stops. For that, it is very adequate. We would then have an easier day getting to Amarillo tomorrow! Below is a gallery of photos from these three days of the trip. Enjoy, and stayed tuned for the remainder of our journey! As online chatter started among Route 66 roadies about the Birthplace of Route 66 Festival in Springfield, Missouri, we thought it might be fun to attend, especially since we weren’t able to attend the festival in Kingman last year and not able to attend LA next year. 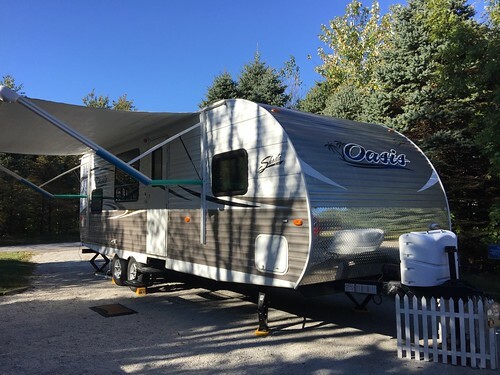 When we thought of attending, we debated on a car trip vs. RV, but after purchasing a new (to us) truck to haul the Shasta Oasis, we didn’t want to leave that costly combo sitting at home collecting dust. If it’s going to collect dust, it had better be road dust! The Rail Haven was booked, and being on Nutrisystem, taking the trailer and eating mainly our own food would be easier and keep me on track. We left Thursday afternoon after work, and our plan was to get to the St. Louis area. We did a lot of research on RV overnight parking (Walmart, Flying J, Cracker Barrel, etc.). Parking options in the area were slim, as most municipalities had ordinances against it, and we didn’t want to risk staying in unsafe areas. Rivers recommended against the Alorton Flying J as very unsafe. Highland, Illinois was recommended as a much better area, but it was pretty warm that day, so we decided to stay at the Red Barn Rendezvous RV Park in Edwardsville, Illinois. It had good ratings as an inexpensive place to stay ($35), especially for overnights. We called to make sure they could accommodate us, especially since we’d be arriving a little after dark. They said that would be no problem. We arrived and they were ready to greet us from their home at the camp entrance (the Red Barn) and were very friendly! We had a pull through site, never unhitched, just needed a slight level, and hookup to electric. We had a quick breakfast at the campground and got ready to hit the road. 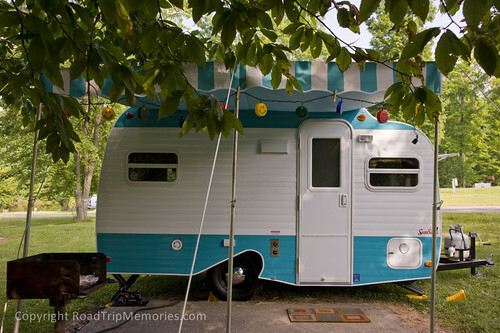 As I was getting things ready, I was thinking about the pros and cons of car travel vs. RV travel. 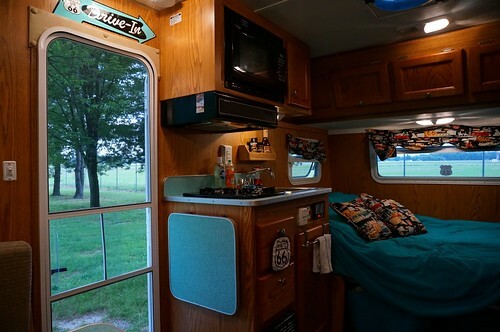 We have not done much RV travel (mainly just weekend camp) but there is a lot of appeal to RV travel. I know that in the future when we either full-time or at least, part time extended travel, it will be fun, but with our limited weeklong vacations, I was hesitant because we only have so much time, hauling the trailer is slower, and you can’t stop as much and certainly not on a whim to grab a shot of a cool neon sign, roadside relics or other offbeat treasures. Especially now, with a truck and trailer combo that’s pushing 48 feet total! So that is a downside; but stopping at places along the way is not totally impossible. Most whims are difficult and like all good roadies, we do like to travel the odd alignments. However, with some planning, we can stop at many attractions and locations. We also can concentrate more on certain locations than we normally do, by stopping earlier and setting up the RV at a place, then exploring the area for the remainder of the day (or longer if we want). So we set sail for the day and made our way around the south side of St. Louis. We picked up Route 66 in Pacific and took as much of the route as we felt comfortable with. Where we knew the road would be too narrow or curvy for the trailer, we took the Evil I but that wasn’t too much. Made a few stops too! Fanning 66 Outpost for some Route 66 Soda, a Route 66 coloring book for our grandson – and bonus, a stand outside selling local honey from Fanning Apiary. Bought a bottle and some flavored honey sticks. Redmon’s Candy Factory is always a must stop for us too. Bulk candy and fresh fudge! 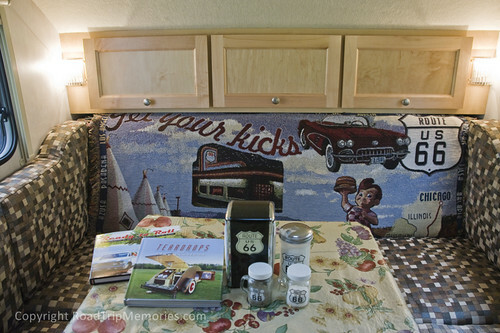 We arrived in Springfield, and made our way to the Springfield Route 66 KOA. 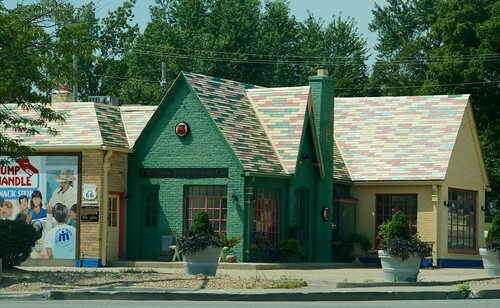 It’s not on an alignment of Route 66 – it’s actually a couple of scant miles south of 266 (Route 66) on the west side of Springfield. They very much support Route 66, too. When we checked in, they told us about the Birthplace of Route 66 Festival and handed us a festival postcard – we said we were in town for the event. They have a lot of great Route 66 merchandise including souvenirs, shirts, maps (including Jim Ross and Jerry McClanahan’s “Here It Is” map series) and books (including Jerry’s excellent EZ 66 Guide for Travelers). The campground is fairly smaller than a few of the other KOAs we’ve been to (St. Louis, MO, Dayton, OH and Louisville, KY) but nice and quiet…except for the trains. It was close to train tracks, which for some people might be an issue. It’s not a far off sound in the distance, it’s pretty close and loud. I didn’t find it a problem, personally – others’ results may vary. I enjoyed it there and would stay again! As we were setting up, Pat met a fellow Route 66 roadie, Chery, who was staying at the KOA in one of the cabins. Most of the other roadies were staying in hotels and motels, particularly, the Route 66 Rail Haven, so it was nice to see a fellow roadie already! We were a little tired from the long drive, and we didn’t think we’d make it to the parade, so we stayed at the campground and relaxed. We also were to meet up with fellow Route 66 roadies and Corsair enthusiasts, Teresa and John. Pat had talked to Teresa on the Route 66 Pictures Facebook Group when she posted photos of some of their Corvairs. Pat offered them a few Corvair wheels, that they were happy to take off of his hands! We chatted for a while about 66, Corvairs and trailers and said good night. I decided to play around with the cable TV setup and managed to differentiate between the satellite / cable / antenna hookups. We didn’t really plan on watching it, but it was there and I had nothing else to do before bed. Today’s the big day of the festival for us – we would have to leave early tomorrow and not attend any of the festival. Getting ready in a bigger trailer is pretty nice. There’s still a little orchestration required but far less than with the Scotty and everything does have a place – even though I’m still getting used to where those places are! We made our way over to the festival area and started with the car show and local vendors – we made our way to The Glass Place, which was where many of our roadie friends – authors, artists, photographers, and collectors – would be. We met up with plenty of longtime friends, as well as many new that we know through Facebook – Jim & Shellee, Jane, Bob, Fred, Chery, Mike & Sharon, Joe, Jerry, Tonya, Bob, Rhys & Samantha, Ron, Joe, Don, Jason & Woody with the Road Crew and met new folks we know online – KC, Nick, Amy, Dora, Geoffrey and even more – Mike & Dean, Steve! It was great seeing and talking to everyone! I helped Jim & Shellee at their booth for a bit while they had lunch and even sold a couple Tourist Trap Tees! 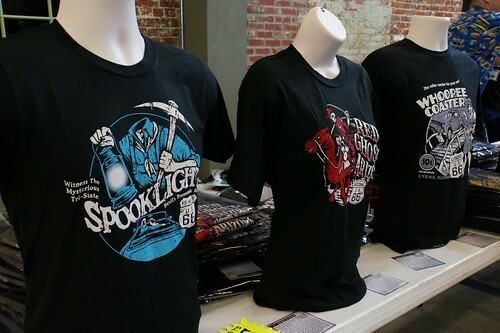 I was wearing mine of the Spooklight, so I already had on the uniform. We saw a few more booths at the exhibit but needed to head out to see The Road Crew show and would come back later. Here’s a couple of videos from the show too! Check out our YouTube Channel for more! The festival was very well done. In its fifth year, they had a car show, the authors / artists / collectors exhibit, concerts, local vendors, a motorcycle show, and kids area with a ton of bounce houses (I can only imagine if we brought our grandson, we’d have to impose a strict limit!). We went back to the Glass Place to see everyone we didn’t see earlier. 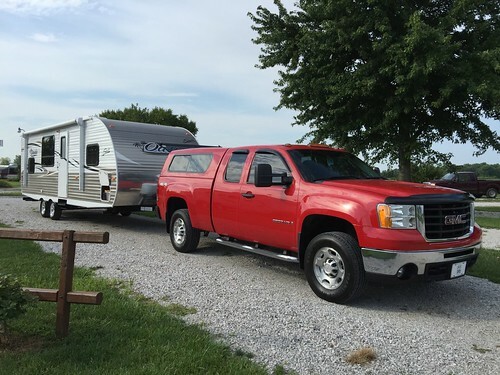 We headed back to the KOA and debated about dinner – I thought it would be good to have a meal out, and we managed to figure out where everyone was gathering thanks to Facebook posts. We discovered everyone was at Colton’s, so we headed over there and were seated pretty quickly. We enjoyed some “onion tanglers” and steak. Remembering that I had a refrigerator on this trip, I opted to do the right thing for my sensitive stomach and save some for later. Good choice. We then headed over to the Rail Haven, where many (most?) of the roadies were staying and the Road Crew was going to perform an acoustic set. Awesome, especially since we couldn’t stay for their Sunday show. 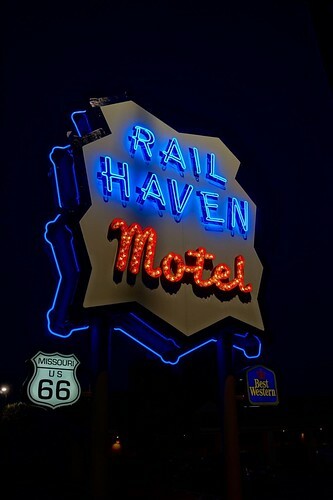 When we first arrived, it was just a notch past the “golden hour” but I still had enough ambient light for some photos of the recently installed replica of the old Rail Haven Motel sign. 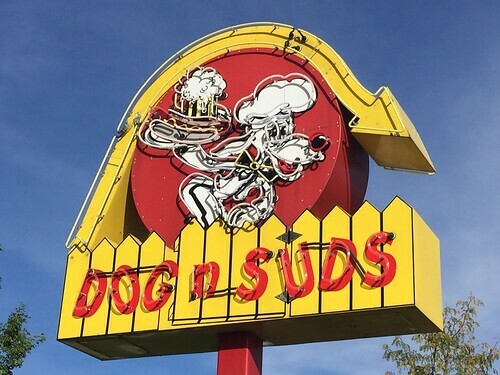 How awesome to have an owner who honors the past and the uniqueness of the original sign. Holiday Inn, are you listening? I headed over to the pavilion just in time to find Pat and we set up our chairs as The Road Crew got ready for their show. Here is a video of them performing “That Ol’ 66″. Check out my YouTube channel for two others! Not too much to say about today, really…we start the journey home early. Break down camp, pack up the trailer and haul it east to Indy all day! No festival attendance for us – yesterday was the big day. We took 66 most of the way out, but would have to take the Evil-I home. However, we did stop at the Route 66 Rest Area and Visitor’s Center – which is a great stop to get not only some info on Missouri but Route 66 too. The rest area is very much themed to Route 66. Here are a few examples, see the gallery below for more! I also enjoyed a new app called iExit. It’s mainly for interstate travel, but could also serve 66 travelers as it quickly brings up services “nearby” based on geolocation from your smartphone. It does very well when traveling on the sometimes necessary Evil-I, by showing you what services are available at upcoming exits and the distance to them. It’s so handy to see at a glance that the next rest area is 58.7 miles, so if you have to “go” sooner, a stop at a restaurant or gas station may be required, and which ones are coming up. Here’s a link to iExit, available for iOS and Android. 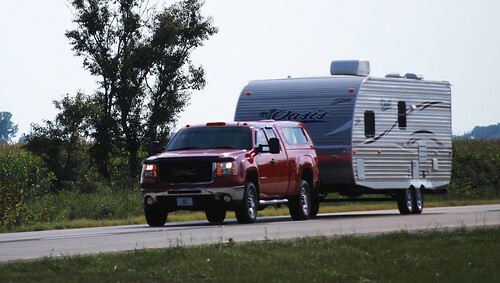 The other thing that made the time pass easy is we knew our RV friends, Dane and Elaine, would be traveling home from a trip to Michigan – so after texting them to see what route they were taking, they replied I-70. So we played a game for an hour and a half where we estimated when our paths might cross and if we could see each other and snap a pic! We did so well as we got to the 113 and 108 mile markers, leaving us only minutes apart. Then, my fear happened when a semi passed us…and slowly, which would block our view. He creeped along, barely passing us. It would have been too risky for us to slow down, as we already cruise at a steady 60 MPH when towing, so we held steady and hoped he’d just move on up and pass us already. Once he did, I gathered myself back up, turned my head to look past Pat and out the driver’s window for a split second as I saw a small silver car that looked like a Toyota RAV4 in the passing line westbound. I thought it might be them…and it turns out it was. Too bad I missed getting a photo, but they got one of us! We set off on our next adventure in a month, a road trip again with the trailer. Plans are sketchy right now, unsure whether we’re going to Michigan or on Route 66. But either way, we’ll be sure to have fun and make more road trip memories! It was a great day to go on a road trip for the day, so we decided to take our grandson to lunch over at the Cozy Dog Drive-in on Route 66 in Springfield, Illinois! Sometimes I sit and wonder when I became addicted to road trips and all of the memories they create. Growing up, we frequently vacationed in northern Minnesota and drove some 800 miles each way from Indianapolis to our destination, which was a cabin at a resort on one of 10,000 lakes. But I think I can point to a trip 30 years ago in July of 1985 that really opened my eyes to what a road trip vacation is all about. It was July 4th weekend of 1985 when my mom, dad, and I loaded up in my folks’ 1977 Chevrolet Impala. I was getting ready to head into my senior year in high school and my five older brothers were all out of high school and working jobs, so we had moved beyond the full family vacation. I was the last one in school, wasn’t working a part time job, so it was natural for just the three of us to hit the road. Granted, my memory on the events of that week 30 years ago isn’t complete, but that trip made an impact on me to where I remember more about it than most people would. Our destination was an area mom wanted to go to, the northern most part of the upper peninsula of Michigan, specifically Copper Harbor, Michigan. We left on Saturday, July 6, 1985. We cruised north out of Indianapolis and went through Chicago via US 41. We didn’t stop in Chicago, but we took the two lanes out of Chicago and into Wisconsin. We continued on through Milwaukee and finally that first night we started to look for a place to stay for the night. Unfortunately we were running out of luck the darker it got. We got into Green Bay, Wisconsin in the 11pm hour that night, and we couldn’t find a motel with rooms to save our lives. We found out we were passing through that part of Wisconsin where everyone stayed who were in for the annual Oshkosh air show, which brought hundreds of thousands in from all parts of the world. So there we sat at midnight in the parking lot of the Holiday Inn in downtown Green Bay. No Vacancy. At this point, mom was pretty hot, in every sense of the word. We were all tired and cranky, and at that point mom told my dad, “Oh, let’s just go home!” to which my normally mild mannered dad quickly shot back with “I’m not driving back tonight!”. Mind you, Indianapolis was some 400 miles back south. Once cooler heads prevailed, it was decided the farther we get away from the Oshkosh airshow, the better luck we’d have finding a room. So we decided to make the best of it and head north out of Green Bay. We motored up US 141, a 2-lane US highway that cut through the woods and pastures of northeastern Wisconsin. Back in 1985, there were very few 24 hour gas stations, and at one point we had to pull off so mom could visit a field so she could relieve her bladder. We still hadn’t found a place to stay, but before we got to the border of Michigan, we found a 24 hour roadside cafe where we pulled in around 1am to grab a bite to eat. I don’t recall the name of the place, but we were all tired, hungry, and half asleep. The one thing I remember about the place is that it was the first time I had a burger that had BBQ sauce and bacon on it. Other than that, I was ready for bed. Fortunately just a few miles up the road, we crossed into Michigan and into the town of Iron Mountain. FINALLY! It was 2am and there was vacancy at the Holiday Motel. After doing some homework, I’ve found that is no longer called the Holiday Motel, but it is still currently in business operating as an Econolodge. After our short night’s stay, we forged north into the upper peninsula at Houghton. Cool little town with a neat little draw bridge that still functions today. On Day 2 we forged ahead and headed towards Copper Harbor, which is at the very tip of the peninsula. We stayed that night at Eagle Harbor at the Shoreline Motel. Loved this place! 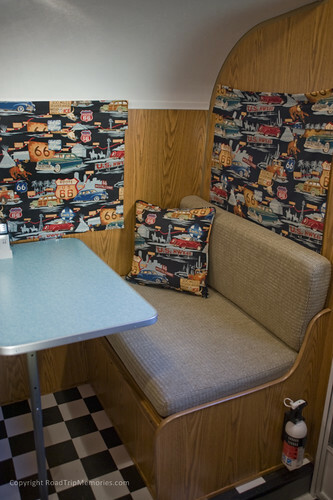 Situated right at the harbor, it’s a little mom & pop motel resort with an onsite restaurant. And much to my surprise, it’s still open with the onsite restaurant. There’s a lighthouse on the other side of the harbor, and I vividly remember laying in bed with the window open listening to the waters of Lake Superior splashing against the beach while the bell on the buoy in the harbor occasionally rang. And a little pesky mosquito buzzed around my ear while I tried to get to sleep. How’s that for a memory? It looks like we stayed in Room 4, as I took a picture with my mom waving at me from inside. We explored the area that next day and made our way into Copper Harbor. The towns up there aren’t very large and thus there weren’t a lot of other tourists. But the scenery is incredible! The Brockway Mountain Drive offers some incredible views of not only Copper Harbor, but also Lake Superior for as far as the eye can see. One thing that was different for me was how late the sun set up there. 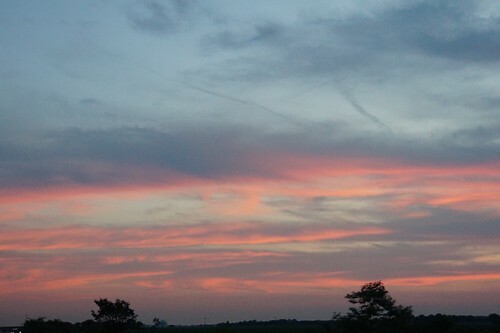 The picture above was taken somewhere in the 9pm hour, and the sunset close to 10pm. That night we stayed at a motel in Copper Harbor, but I can’t for the life of me remember the name. It was situated back into some trees not far from the end (or beginning) point of US 41. 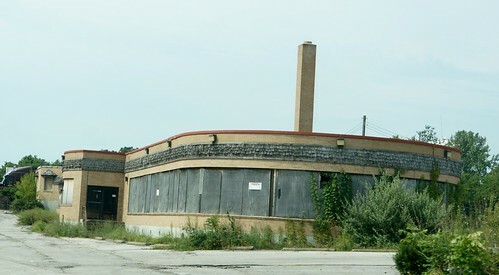 The last time I was up there, the motel was closed, but the building was still standing. That night we ate at a restaurant that still is there today called the Harbor Haus. Great seafood they had with a great view of the harbor. One of the locals told us if we really wanted to experience Copper Harbor, we needed to head to the city dump at sunset. Apparently black bears made there appearance at the dump and it was quite the tourist attraction. The dump is now closed and the bears find their food by other means, but it was one of the highlights of the entire trip. For the remainder of our trip, we headed west and went into our old vacation spot of Park Rapids for a couple of nights before working our way back home. Not to say that leg of the trip wasn’t fun, it wasn’t new and adventurous as the first 3 days were. So as the 30th anniversary of that trip approaches in a few weeks, I look back on it with great memories, especially knowing it was the last trip I’d take with both of my parents, as my mom passed away a little over a year later. Her passing made the trip that much more special. And as a 17 year old, it made an impression on me that shaped me as a traveler. I hope to get back up there and retrace as much of that trip as I can. Perhaps even stay at one or more of the rooms we stayed in. There’s a lot of my soul as a road warrior up there. My passion for hitting the road is deeply rooted in the memories of that trip, and those roots are alive and well in the Keweenaw Peninsula of northern Michigan. **All photos above were from the trip.